Uncertainty and confusion for Aboriginal and Torres Strait Islander organisations with Indigenous Advancement Strategy funding round. Aboriginal and Torres Strait Islander rights advocacy organisation ANTaR today called for greater transparency, clarity and engagement in the approach to funding Aboriginal and Torres Strait Islander services, programs and organisations. Read our release here. ANTaR today supported calls made by Aboriginal and Torres Strait Islander community leaders yesterday for the PM to fix the Indigenous affairs policy and funding chaos. ANTaR today called on the Cabinet to rethink the suite of budget cuts to Aboriginal and Torres Strait Islander programs and services. 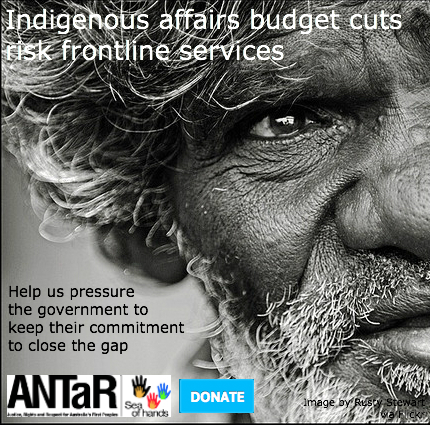 See our info graphic showing the impacts of cuts to Indigenous Affairs in the Federal Budget.